CPS Energy has taken a major step in using new technology to produce emission-free renewable energy during high energy use days. 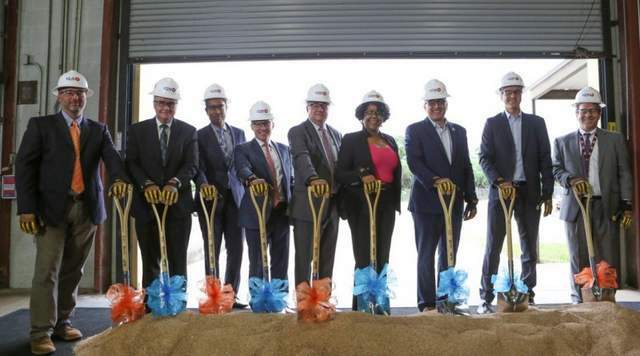 This focus on reliability, environmental stewardship and innovation was announced today as Greater San Antonio’s natural gas and electric provider broke ground on their first solar energy and battery storage project. The project is a culmination of three years of work which included a partnership with Southwest Research Institute (SwRI). For their part, SwRI is providing nearly 50 acres of land on which the solar facility and battery storage system will be constructed. SwRI aims to gain valuable insight into the efficiencies of both solar production and battery energy storage. Sharing that information with CPS Energy will provide the utility with vital information that someday may lead to similar projects on a larger scale as they continue to execute their Flexible Path. The $16.3 million project, which will be constructed by RES Americas, was approved earlier this year by CPS Energy’s Board of Trustees. The site will consist of a 5 megawatt (MW) solar power facility and a 10 MW battery storage system located at 9800 W. Commerce in San Antonio. As a leader in developing alternative energy and battery technologies, SwRI will help showcase the site as an example of energy innovation. “As beneficial as the site will be to the city’s energy future, SwRI will also benefit by leveraging the facility to become even more active in the grid-scale energy storage industry, and to work with battery suppliers and component manufacturers,” said Daniel Stewart, Vice President of the SwRI Powertrain Engineering Division. In 2016, CPS Energy applied for and was awarded a New Technology Implementation Grant (NTIG) for $3 million from the Texas Commission on Environmental Quality (TCEQ) to fund part of the project cost. The primary objective of the NTIG program is to offset the cost of the implementation of existing technologies that reduce the emission of pollutants from facilities and other stationary sources which may include electricity storage projects in Texas. CPS Energy received and evaluated 22 proposals for an engineering, procurement and construction contractor for this project.